The Board of Investments (BOI) began the year with a 91-percent increase in investment approvals for the month of January, the country’s top investment promotion agency reported Monday. BOI said project registration for the first month of the year jumped to P97.9 billion from only P51.3 billion in January 2018. “We are definitely off to a positive start in 2019 and it augurs well for the rest of the year as we aim to cross the uncharted trillion-peso mark in investment approval for the whole year,” Trade Secretary and BOI Chairman Ramon Lopez said. 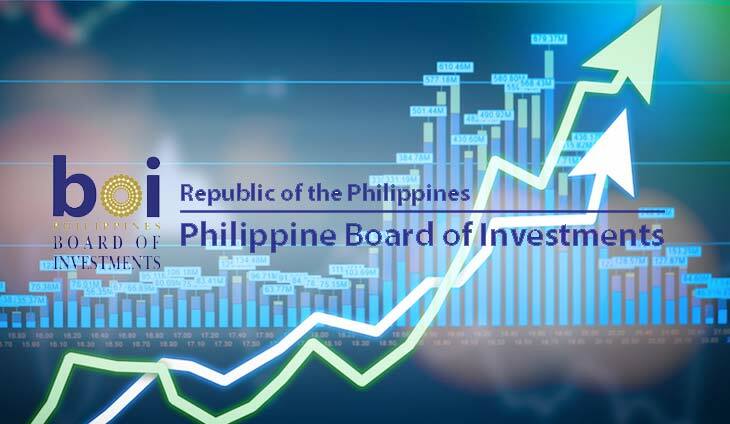 Big-ticket investments in the sectors of energy, telecommunications, and manufacturing composed BOI’s notable investment approvals last month. Among those registered by the BOI in January was the P48.4-billion project of Rizal Wind Energy Corp., which is expected to generate 603 megawatts of power. A P33.1-billion broadband infrastructure project of Metroworks ICT Construction, Inc. was also approved by the BOI in the previous month, as the country opened its telco industry to a new player. Solid Cement Corp. also got its project registration from the investment promotion agency last month for its P12.5-billion cement plant in Antipolo, Rizal. “We pick up where we left off as we continue to build and expand the manufacturing base on the back of a robust national industrial policy,” Trade Undersecretary and BOI Managing Head Ceferino Rodolfo said. He also pointed out that investment pledges in the manufacturing sector in January 2018 amounted to P37.3 million. Further, the BOI approved the P849-million healthcare project of Allied Care Experts in Dumaguete City. Rodolfo mentioned that the investments approved by the BOI last month will boost economic activities outside Metro Manila as these projects are located beyond the borders of the National Capital Region (NCR). Bulk of the investments is in Region 4-A (Calabarzon), amounting to P60.9 billion. This is followed by Davao Region, Region 4-B or Mimaropa, and Cagayan Valley. Investment pledges from foreign sources were also upbeat in January, with approved foreign investments surging by 31,903 percent to P10.6 billion this year from P33.1 million in January 2018. Top foreign sources last year include The Netherlands — with its investment in Solid Cement, as well as Japan, and South Korea. The country’s economic growth in the past years, despite the headwinds, was backed by rapid increase in investments’ share to gross domestic product (GDP). Earlier, Finance Undersecretary Karl Kendrick Chua mentioned that share of investments to GDP in 2016 was at 24.4 percent and further increased to 27 percent in 2018. This was an improvement over the 15 to 20 percent level in the early 2000s. “[G]iven the strong and sustained confidence of domestic and international investors in the Duterte administration, we hope to make it a yearly record-breaking habit until 2022 and even beyond,” Lopez said. Tags: Allied Care Experts, Board of Investments (BoI), Cagayan Valley, Calabarzon, Ceferino Rodolfo, Davao region, Dumaguete City, Duterte administration, gross domestic product (GDP), January, Karl Kendrick Chua, Metroworks ICT Construction Inc., MIMAROPA, National Capital Region (NCR), Ramon Lopez, Solid Cement Corp.